The Full Spectrum Plus is the industry leader in Autosomal DNA analysis of your personal history. 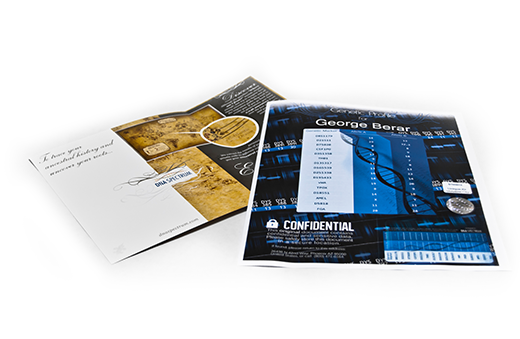 This package provides the most in-depth analysis, visually- striking results, and online resources. It is ideal for someone who is interested in where they came from and wants to know and see all of the details. 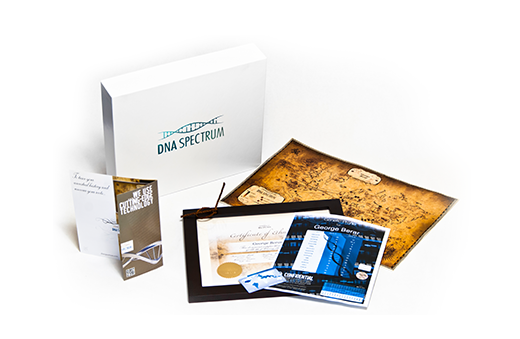 The myDNA ID Card, Framed Deluxe Certificate of Ethnicity, and Premium Atlas of Ancestry are the perfect complements to the Complete DNA Spectrum Test and Genetic Profile, which are also included in this package. This analysis is performed after we receive your DNA sample at one of our laboratories. 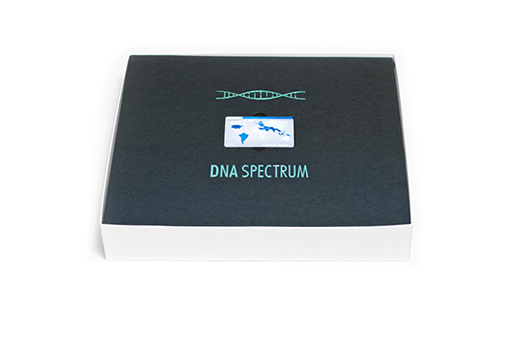 This package provides the most detailed analysis of your genetic code. The analysis matches your DNA with 115,000 individual forensic records in over 400 known world populations and reveals the detailed results, including your top 50 individual rankings and your deep ancestry results. These populations account for much of the known historic migration of people. Through our advanced statistical analysis, this can truly answer the question, "Where am I from?" Your exclusive myDNA ID card provides a striking overview of your Genetic Profile and geographic heritage at a glance. It contains a unique QR code that enables the controlled sharing of your results with your family and friends. 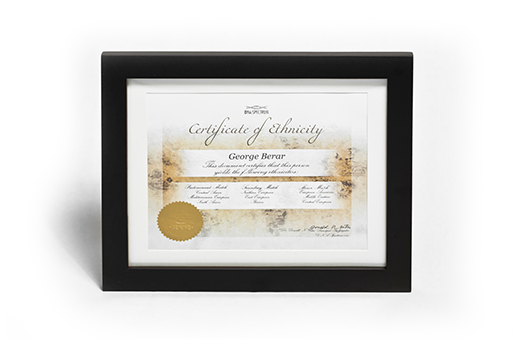 The framed deluxe certificate shows your name and ID number above your Predominant, Secondary, and Minority matches. It is authenticated by both our lab and principal investigator, and it is ideal to display on your wall or show your family. This certificate authenticates your heritage for all to see. 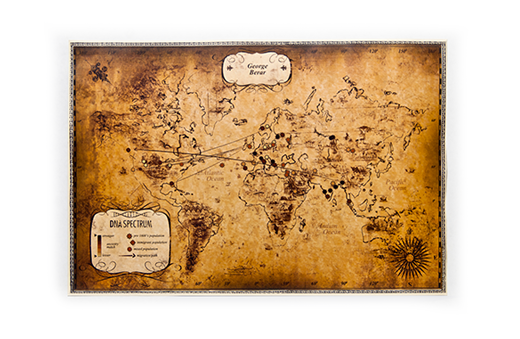 This striking world atlas is a unique visual way to understand your connections throughout history to different parts of the world and to diverse populations. You can see your ties to different groups of people, the strength of those ties, and how your ancestors have migrated through time. This report displays your unique autosomal genetic profile, which is 99.9999% exclusive to you. This is the same profile that universities, courts, and law enforcement agencies use to identify individuals in the United States. We use the highest level of security to protect your results. Please safely store this document in a secure location. 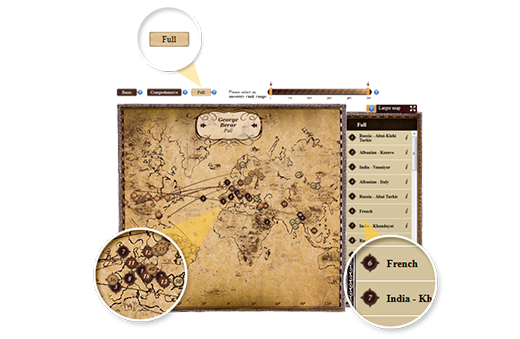 Your myDNA account provides a great way to share and explore your interactive results. From here you can delve deeper into the details of your test results, learn about DNA Spectrum's science and methodology, or simply compare your genetic profile with friends and families. The myDNA account is also your access to any new tests we develop as well as new technologies and information about the Genomics Age. Complete Ethnic markers represent full deep ancestral roots spanning as much as approximately 50 generations. These interactive, online results span ethnic regions across the globe and are divided into Asian, Western European, Eastern European, Native American, Jewish, and Sub-Saharan African before being sub-divided into more exclusive groups. 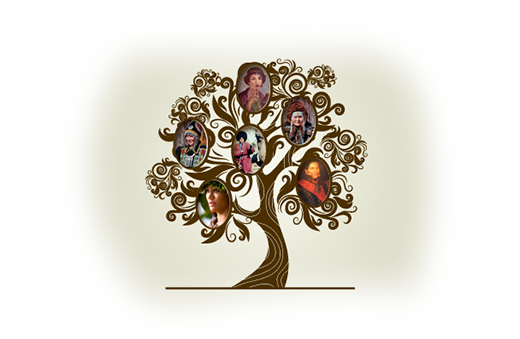 This process can provide a fascinating overview of your family`s deep history and reveal connections that may have been lost in the recent past.